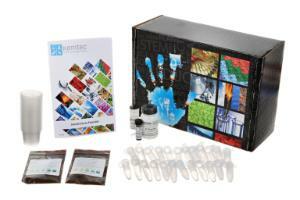 This kit determines the amino acid sequence of a tripeptide isolated from a protein hydrolysate. With this kit, students determine the chain length of the peptide by formol titration and identify the amino acid content and composition of the tripeptide by using chromatographic techniques to determine Rf values. Students also identify the N-terminal and C-terminal residues using solvent extraction, enzymatic digestion, and chromatographic techniques. Ordering information: This kit includes a spray bottle, glass vials, ammonium sulfate, acetone solution, glacial acetic acid solution, lead acetate solution, sodium hydroxide, albumin, casein, and gelatin.